Parisian-like architecture of the Belle Époque is what Buenos Aires is famous for and which makes the city so charming. The way the houses are build is a clear expression of the yearning of the mostly European immigrants for their old homeland. If you walk through the streets and avenues of Buenos Aires you will literally sense the nostalgia and faded memories of thousands and thousands of immigrants, exiles and expatriates from all over the world. It won't take long and you will begin to color and furnish the beauty of the architecture with your own emotions and memories. What do you think is good architecture all about? If I hadn't clicked on your blog, I would have bet good money this photo was from Paris! ah, very pretty and well cared-for building. I have to say that locations with good weather and not much pollution have the best chance of preserving their buildings. California is a great example (of the weather, not the pollution). They have gorgeous buildings from the 1950s that look pristine. This is a great angle...it makes the photo a story not just a shot. Who might be going to the airport from these fabulous old buildings? You have very impressive architecture in Baires! If these immigrants (mostly from Italy, Germany and Spain) were yearning for their homeland so much, don't you think it's strange that that they elected to build in the French style...hmmmm. Simply put, no. 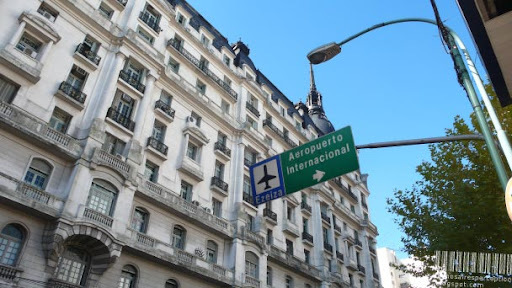 You will find almost every architectural style in Buenos Aires. This one in the picture is just an example for the Parisian-like residential houses you will find in Buenos Aires. Nice angle, in which you've shot the picture! The signboard gives an impression as if it is touching the buidling! !